Organization: Field is 35 x 15 as shown. 2 teams of 5 plus a goalie. 2 nets, Soccer balls in each goal and with the coach. 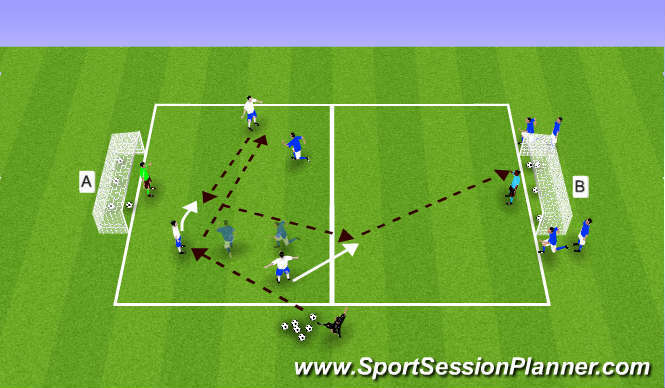 Description: Play starts with the coach serving a ball into the 3 attacking players. 3 attacking players are in their own end as the coach serves the pass. One of them control and build play towards goal (B) in order to score. At the same time 2 blue players start on the half way line adn try to win the ball and score on goal (A) as soon as the white team has one touch on the ball. The blue team must play three passes before they can enter the opposite half and score. When a goal is scored or a shot is taken, or ball knocked out of play, the process is repeated in the opposite direction with the 3 blue players now attacking goals (A). Continue this rotation. - keep ball out of your feet and get head up to see passing opportunities.